On Mother’s day, we went to another one of our favourite Chinese restaurants to celebrate with my grandma and uncle. Cuisines other than chinese are out of the picture of course, since grandma doesn’t take to any of them. The good thing about Peach Garden is they have fantastic set menus that serve individual portions instead of communual ones (of course they still have communual portions in their ala carte menus). Saves the hassle of splitting everything up, waiting for your turn to come and having to deal with dirty plates when there’s slow service (I hate this, especially). I would say the food here is sort of a fusion between East, meeting a little of the West. 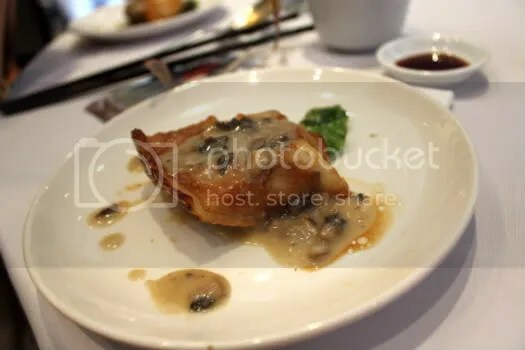 I emphasize a little because the Western influence is very slight, so it’s still acceptable to the older folk but a pleasant change from the regular food we get from Chinese restaurants. We come here only on special occasions because of the pricey menu. I believe the Mother’s day menu set Dad back by $90+ per pax. But was well worth it considering the quality and amount of food we had, discounting the horrible dessert which was quite a disappointment. 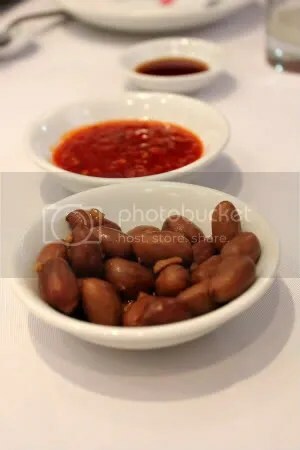 I’m particularly fond of braised peanuts, because they remind me of my first proper outdoor camp at obs. We had those canned versions, full of msg and stuff but hey, comfort food that doesn’t require cooking 😉 These are not canned of course. Good nibbles before the mains arrived. We all enjoyed our starters very much, grandma included. Huge chunks of lobster meat sitting on a bed of bitter pomelo flesh. The little balls of agar (at least that’s what I think they are) look like caviar no? The dressing tasted like some thai sauce, sourish and sweet. Very refreshing. 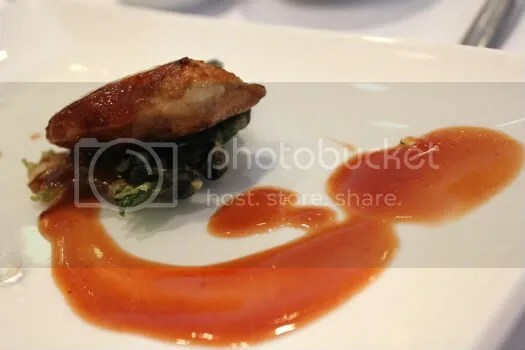 I don’t really appreciate foie gras, especially from chinese restaurants. 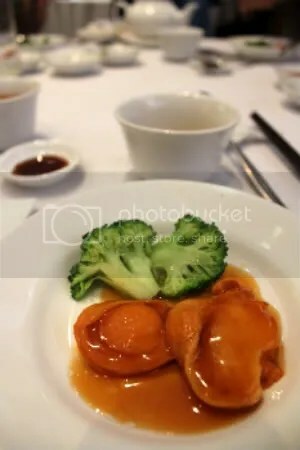 We had one at taste paradise during cny (by the way, taste paradise is only good for dim sum in my humble opinion, the ala carte items and their set menus aren’t very inspiring) and it was… horrible. Didn’t appreciate the squishy slab that oozed oil everytime I sliced it. I mean, I’m not against unhealthy food, but I can’t swallow the fact that something so unhealthy can taste so bad. Watching how they make foie gras on youtube didn’t help either. But dad inadvertently ordered it so instead of letting it go to waste I had a bite. Boy, this was miles better than Taste’s rendition. Pan seared, no oil oozing out. Slightly crusty on the outside and soft within. The accompanying crunchy vegetable tempura and sweet sauce went exceedingly well with it too. 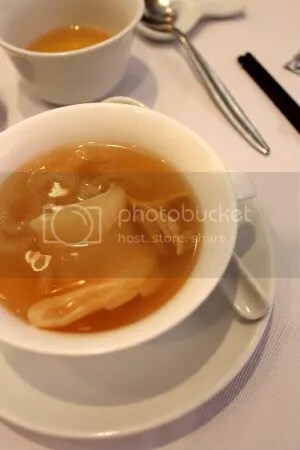 I don’t take shark’s fin so dad replaced mine with this double boiled soup that had topshell and fish maw. Very clean tasting and I appreciated the generous portion of the aforementioned premium ingredients. 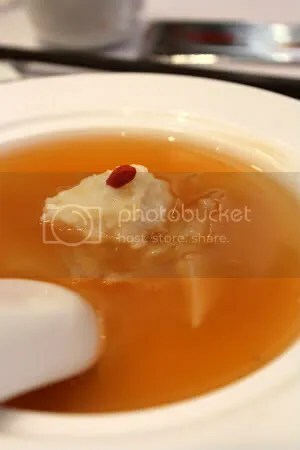 The rest got their shark’s fin soup – totally defeats the purpose of me drinking another type of soup- and they seemed to enjoy it. And then there was this huge slice of sea perch served. Goodness, it would have passed off as a main course in french fine dining establishments! You can see the western influences again from the creamy mushroom sauce. The fish was flakey and firm. Tastes like a cross between sun hock and black cod. 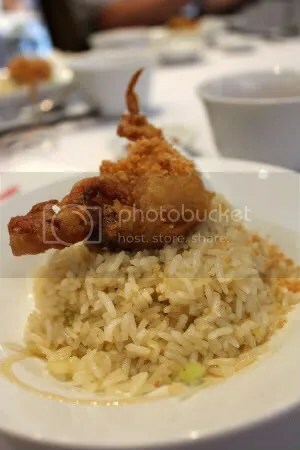 Soft shell crab deep-fried served with chicken rice. I was pretty full by then but the soft shell crab was so sweet and crunchy (need I mention it was also so easy to eat, no peeling and whatnot) that I finished it in a flash. The rice was fragrant and well-oiled. Grandma finished everything! I shan’t show you the horrible dessert. But if you do have a choice I highly recommend the pulut hitam with vanilla ice cream served in a baby coconut. It is a decadent dessert, quite heavy in fact so you might want to consider sharing it with someone. Peach Garden has many branches. I’ve only tried the one at Novena Gardens so I can’t compare the standards for the rest. Reservations are a must, especially during weekends! The place is quite small, so it’s not ideal (though still possible I guess) for huge family gatherings. 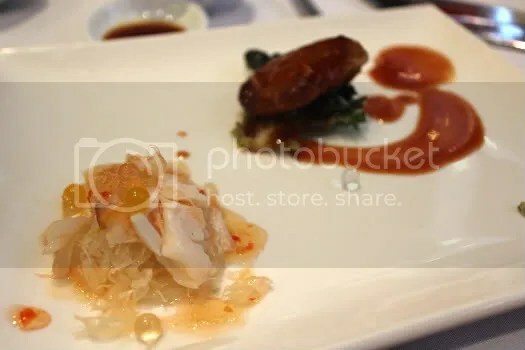 Other than that, it’s the perfect place to go if you are looking for fine chinese cuisine with a touch of western influence.